The 6th Africa Sugar Conference is the largest annual sugar gathering in Africa. This year, it took place in Mozambique and was co-hosted by APAMO, the Mozambique Sugar Producers Association. Like in the previous years, it gathered international experts, key speakers, governments and associations and top players across the industry chain. The three-day event (from 30th March to 1st April) had a rich programme of conferences on the sugar cane industry. Topics ranged from ways to improve sugar productivity in Africa (also thanks to new technologies) to the changing international sugar trade environment, as well as dedicated focus presentations on the sugar industry in different African countries (Mozambique, Ethiopia, Uganda, Morocco, South Africa, Ghana and Malawi). A world leader in sugar cane harvesting solutions, Case IH participated as Gold Sponsor of the event for the sixth year in a row. In collaboration with its official distributor in Mozambique, Entreposto Comercial de Mozambique, S.A., Case IH demonstrated part of the Case IH line-up to support sugar cane producers in every phase of the process with a full range of high efficiency equipment for the industry, from bush clearing to harvesting and transportation to the mill. Matthew Foster, Vice President and General Manager Case IH for Europe, Africa and Middle East, held a speech on the first day of the event: All From One – Case IH, Your Ideal Partner For The Sugar Industry. In Africa, as elsewhere in the world, sugar cane growers need to face some of the most difficult challenges in nurturing crops from establishment through to harvest: from tough ground conditions on both ends of the season to big yields and lengthy harvest periods, not to mention the constant pressure to keep the sugar mills supplied with the quality and the quantity they expect. 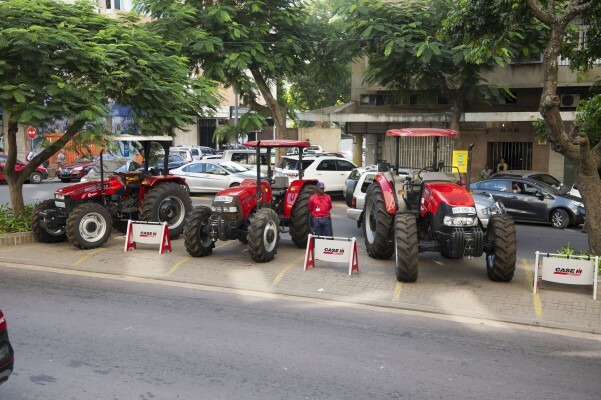 Case IH has extensive experience in the demands of sugar cane production around the world. Drawing on over 50 years of experience in this sector, the company offers a complete range of equipment for sugar cane production: the cultivation equipment to prepare the soil and the sprayers to look after the crop and the most trusted line of harvesters in the business. Case IH has the most proven line of harvesters available in the market, the Austoft® 8000 Series. These machines are the industry’s highest capacity sugar cane harvesters and ideally suited for the most demanding productivity and performance needs. The Smart Cruise technology automatically adjusts engine rpm and reduces fuel consumption up to 0.7 litre of fuel per tonne of cane billet. In addition, Case IH offers the Austoft® 4000 Series, specifically designed for small up to medium sized landholdings or big plantations with reduced row spacing. Also the exclusive, factory-fitted AutoTracker helps to minimise cane losses. Cane stalks are cut at ground level, and the base cutter height is either controlled by the operator or automatically by the AutoTracker which consists of two rotating discs with 5 blades each. The cutter angle can be adjusted from 12.5º to 17.5º. On average, the AutoTracker reduces stool damage by 27.2%, root ripping at the end of rows by 28.3%, and the overall cane losses by an impressive 62.9%. Case IH’s offering is complemented by a full range of equipment for sugar cane operations, including the renowned Steiger®, MagnumTM and PumaTM Series of high horsepower tractors, self-propelled sprayers, tillage and seeding complexes, balers and other attachments, and a line-up of precision farming solutions. And there is more to it. 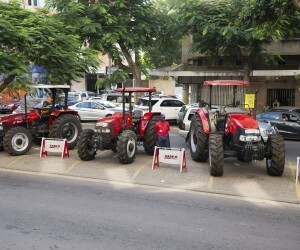 Case IH is the first manufacturer of agricultural machines to feature a unique yield mapping system for the sugarcane industry successfully tested in Brazil. The new tool – now also available in the Africa and Middle East region - uses the precision farming concepts to record and compare the productivity of sugarcane fields with great precision. The technical information is generated during harvesting, providing a detailed history to avoid replanting in unnecessary areas or overdose on fertilizing in productive areas. Danatech is a company providing Agricultural Services in La Reunion. His Manager, Jim Hourau is very satisfied with their Case IH Austoft 8000 bought in 2015: “During the harvesting season, sugar cane factories in La Reunion never stop and need to be constantly fed with canes, so my company needed a reliable machine able to work long hours at good speed.” Danatech’s Case IH sugar cane harvester cuts approximately 1,000 tons per day of green cane during peak season; a very good result, especially considering the difficult African soil! When asked about the Austoft 8000 best features, Jim puts the Anti-Vortex cleaning system at number 1. This is the most modern and efficient cleaning system in the industry: it reduces extraneous matter and cane loss and dramatically improves the load density for transport, which lowers operating costs.